Reefer Madness was made in 1936 as a cautionary tale about the dangers of marijuana use, but the ignorance in the actual effects of the drugs on the filmmakers part has made this a cult hit among potheads and cinephiles alike. In fact, with midnight screenings running near colleges, this could be considered the unintentional birth of cult cinema. What is even more baffling about this film which shows the dangers of jazz music and pot-smoking in a ridiculous fictionalized story is the mystery behind its actual production. Some say it was produced by a church, but the film was never officially entered into the copyright registry. Since 1936, we have come a long way with stoner films. These days they are no longer cautionary tales, but are directed at the drug-using community instead. Various studies have shown that 42 percentage of American have tried marijuana and 16 percent are regular smokers. 52 percent believe that it should be legal. This is a growing number and Hollywood never lets an audience market go unnoticed. 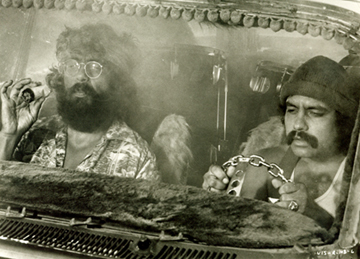 There have been many stoner icons throughout the years of cinema, most notable being Cheech & Chong in the 1970s. A Russian American and a Mexican American became synonymous with the plant, just as Jay and Silent Bob were in the 1990s, and in the same way Harold and Kumar are for this generation. The difference is the intelligence level of the potheads, and the Harold and Kumar films show hard working and intelligent Asian and Jewish men, who also happen to love smoking. Gone are the days of stereotypical lazy stoners like Cheech & Chong or Jay and Silent Bob, and in their place are functioning pot smokers. 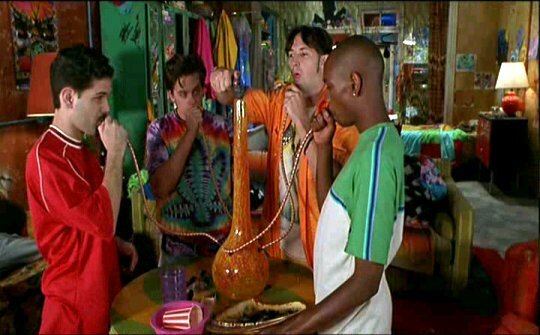 Co-written and starring Dave Chappelle, Half Baked features a great deal of comedic pot smoking while maintaining a pro-sobriety ending. It existed during a time where medical marijuana was still a story that was passed around, almost like a rumor which was too good to be true. The film itself is about as half-baked as the cast appears, but few films delve as cleverly into the routines of habitual smokers. There seem to be two winning elements in the film, which is Chappelle and Neal Brennan’s screenplay and the casting of countless supporting characters and cameos. The group of friends includes Chappelle, Guillermo Diaz, Jim Breuer, and Harland Williams. The film also co-stars Rachel True as the love interest that makes our protagonist throw away his stash. Tommy Chong also shows up for an appearance as the Squirrel Master. My favorite parts of the film include the celebrity names attributed to the water bongs, as well as the way that they filmed the effects the medical marijuana has on each smoker by having them literally elevated off of the ground and near the ceiling. This is the quintessential stoner comedy, mostly because it was the first intentional one ever made in Hollywood. Before this was only Reefer Madness’ unintentional humor, but suddenly the arrival of Cheech Marin and Tommy Chong as the loveable loafers, Cheech & Chong, changed the course of comedic cannabis cinema. Marin and Chong had been a comedic pair for ten years before they made this first film, with seven to follow. The latest is an animated film of some of the popular old sketches and some new ones as well. The plot of this original film is rather simple, but genius. Two clueless stoners end up accidentally smuggling a van made entirely of marijuana. They are complete stoners and have no idea what they are in possession of for most of the film. The comedy is silly, but the movie is more about the dynamic between the two opposing personalities that these comedians created together. Many of the films on this list, and in any stoner comedy for that matter, are heavily about the bonds of friendship. Stoners stick together, apparently. The first Harold and Kumar was a revelation, a return to the smartly written weed comedy duo days which had been gone since the parting of Cheech and Chong. It was a road trip comedy in structure and a slapstick drug trip in content. The lackluster sequel brought a few laughs and a vaguely similar scenario. With a “bottomless” party and a look-alike actor playing our infamous former president, the Harold and Kumar sequel also had an abundance of Bush jokes. 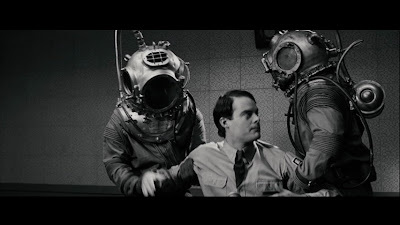 The third film brought a little bit of holiday cheer in the form of an assaulting 3-D movie. Cocaine rains across the screen and everything from feces to eggs are thrown at the audience. But beneath that is a continuation of a series about the friendship of two very different minority pot smokers. 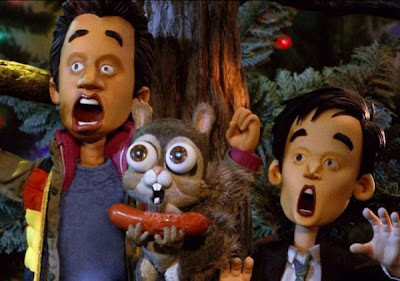 There are many more drugs than marijuana in this second sequel, A Very Harold & Kumar 3-D Christmas, even inspiring a claymation sequence when an unknown substance in ingested in eggnog. And no Harold & Kumar film is quite complete without a visit from Neil Patrick Harris as himself, this time even showing off some of his Broadway talent with a song and dance. 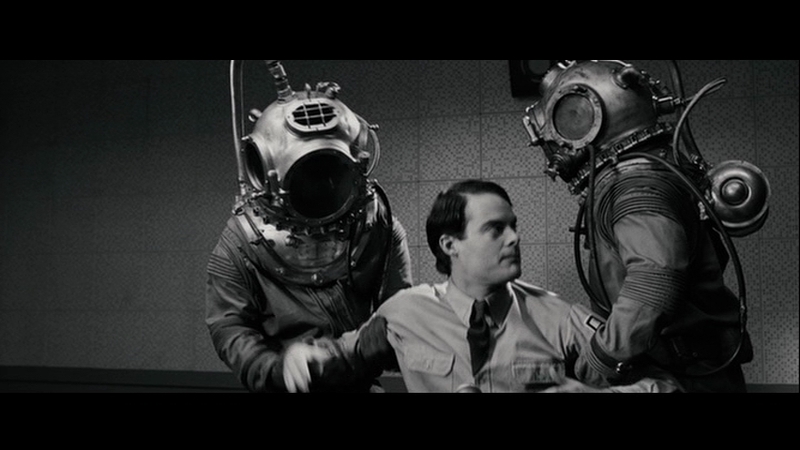 There are many hilarious riotous moments within these three storyline, however sweet the sub-line of the film may be. My preference actually lies most with the third and final film in the franchise. One of these running gags involves a baby. Imagine that the baby in The Hangover had been treated the way the monkey was treated in The Hangover Part 2. Now double that and you will have an idea of what the baby in A Very Harold & Kumar Christmas withstands. Even the claymation sequence, which has forever been synonymous with Christmas specials, is wrought with violence and bloody mayhem. Throw in a few car crashes, a violent Russian mob boss and you have one extreme Christmas film. Typically when one thinks of a Greg Araki film it is the heavier disturbing issues that come to mind, usually involving sexual abuse of some sort, recently with underage children and of a homosexual nature. Even though he has made films with comedy integrated as well, this is not the director I would have imagined chosen for a stoner comedy. The thing about Smiley Face is that it is painstakingly accurate in many ways. 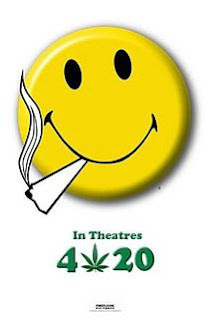 While other stoner films are trying to appeal to the nature of the assumed stoned audience, whereas Smiley Face simply tries to recreate what it is like being extremely stoned. This means the film is often filled with what feels like obtrusive and exaggerated noise for anxiety and several representations of paranoia. In other words, the entire ride is not entirely enjoyable, but it is nearly always dead on. What makes the film so painful is the fact that our protagonist Jane F (Anna Faris) is both barely functional as a stoner, but also happens to be extremely stoned on this particular day. Jane is an actress, mostly unemployed and stoned all day, but on this day she eats her roommate’s (Danny Masterson) entire batch of cupcakes. What Jane doesn’t realize is that the cupcakes were pot-cupcakes, and becomes extremely stoned. The rest of the day spirals out of control as she tries to set this one action right, owing her dealer (Adam Brody) and needing to get to Venice Beach to pay him back, among other tasks. When in desperate need of help Jane even calls her roommate’s geek friend (John Krasinski) who is infatuated with Jane. Jane’s day gets worse and worse as she makes each bad decision. The exaggerated effects of weed smoking are believable because Jane has ingested so much of it. I never would have imagined David Gordon Green as the director for the Judd Apatow produced and Seth Rogen written stoner comedy, Pineapple Express. The combination of independent/art film director and stoner comedy is far superior to the sloppy and silly styles of the past. Although it is clear that the Apatow-style of improvised dialogue made its way into filmmaking process, there is still a sense of the director who is better known for his slow-boil independent southern dramas. This film was a breakout hit in many aspects, but the main reason that I love it is James Franco. Franco owed a great deal to Judd Apatow, as it was “Freaks and Geeks” which first put him on the map, along with Rogen, Martin Starr, Jason Segel and countless others. And yet, Franco quickly become busy playing serious roles and making PG-13 blockbusters that were clearly meant to catapult him into fame. This never really happened, and instead he truly began to shine when he returned to comedy as Seth Rogen’s dealer in Pineapple Express. Nominated for awards for his supporting performance, Franco steals the show and makes this the ultimate buddy action comedy. The end of the film is also a shocker, going from silly action comedy to gruesome and violent without losing any of the slapstick humor. It is also impossible not to mention Danny McBride, who makes the duo a trio. My favorite moments in the film include all of the scenes in the woods, especially when they are trying to destroy their cell phones, and the fight scene with Danny McBride. There is also no beating that first scene with the cross joint. Do you think James Franco's character was based on Brad Pitt's character in True Romance?